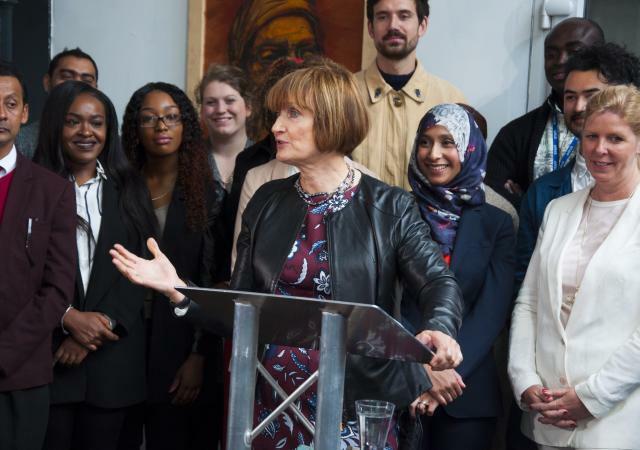 Tessa Jowell at her campaign launch in Brixton. Photo by Andy Thornley. "In many ways London is the greatest city in the world — a byword for ingenuity, for tolerance and for optimism... My ambition — our ambition — is to make London greater still. To build One London, where every Londoner has the opportunity and security to succeed, where Londoners have a quality of life to rival anywhere in the world, where no Londoner is left behind. One London, not the two we see so often today — where some of the most severe poverty in the country is on the doorstep of some of the richest places in the world." Jowell joins Diane Abbott, Sadiq Khan — who gained the backing of Ken Livingstone and Oona King yesterday — David Lammy and Christian Wolmar in the running to be Labour's candidate for London Mayor in 2016 — and also Gareth Thomas, MP for Harrow West. (Yeah, we had to look him up too.) So that's six of them vying to be on next year's ballot and the decision won't be made until September, so expect a lot of posturing and arguments about which would be the best form of rent control for London. If you want to have a say in who Labour's candidate will be, you can sign up as a 'registered supporter' for a fee of £3. That'll get you a vote in the primary. But who to vote for? Unlike all the previous mayoral elections, there isn't an obvious candidate. That could turn out to be a blessing in disguise: we've had 15 — soon to be 16 — years of larger-than-life, fairly divisive characters at London's helm. It might be dull, but we're finding ourselves hankering after a centrist; a bit of an admin bore, a roll-your-sleeves-up type who will work cross-party and actually get things done (*cough* build more bloody houses *cough*). That may well be Jowell — plus she has the advantage of not having to quit her day job if she gets nominated, unlike the four MPs.